I’m not sure what you mean by ‘strong regional identities’. Does Karnataka have a weaker regional identity than Orissa or Kerala? Why – is it because they vote for national parties rather than regional ones? If so, isn’t this a tautology? The Congress received 29% of the vote in 2009, as compared to 31% for BJP in 2014. Despite the small difference in vote share, Congress only won 206 seats in 2009, while BJP won 282 in 2014. One of the goals of the article is to understand why BJP in 2014 did a better job in converting vote share into seats than Congress in 2009. Karnataka is a bad counterexample because it is essentially characterized by competition between the two national parties. 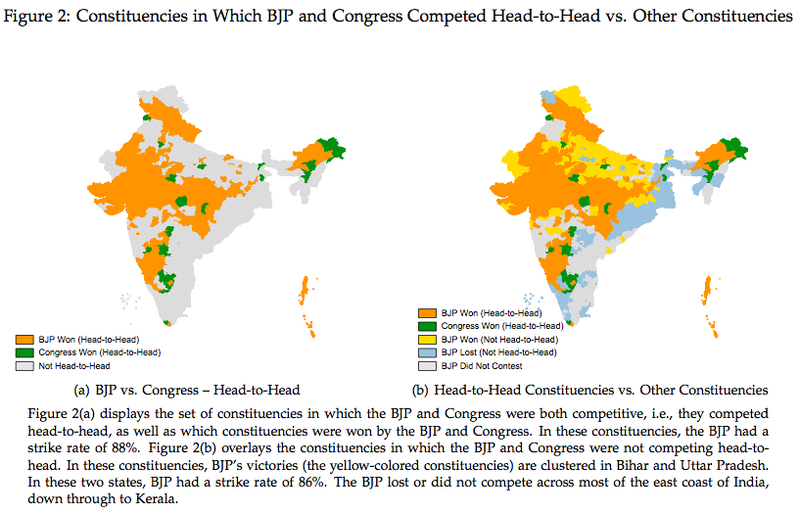 A better counterexample would have been Maharashtra, which also has strong regional parties. 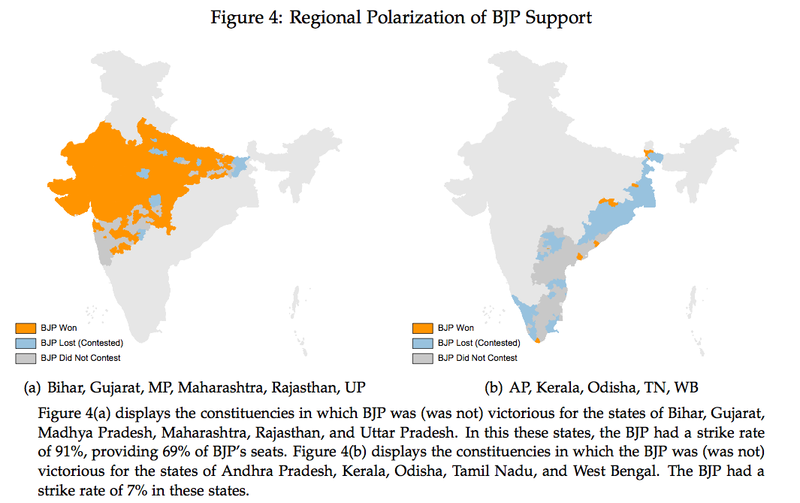 As I described, the difference in Bihar and UP (and Maharasthra), which also have strong regional identities and parties, is that the BJP already had an existing electoral base in these states. 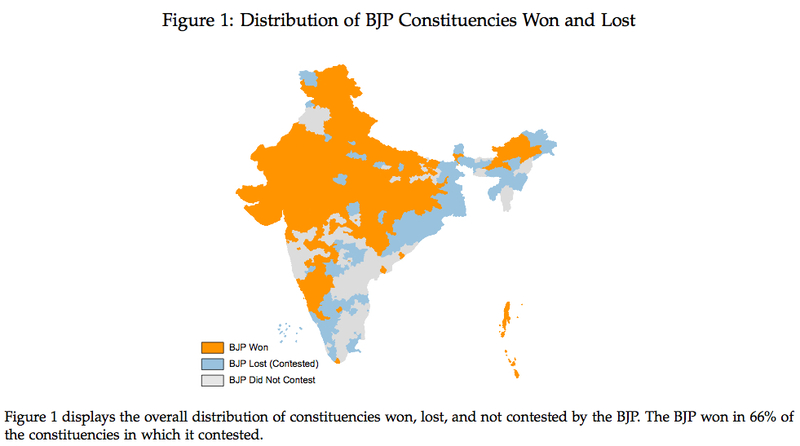 So the BJP was unable to break into states where it didn’t have those sorts of existing electoral bases when those states were characterized by strong regional parties and identities. Interestingly, I think the one state where the BJP is making moves is in Odisha. It was competitive in nearly half of the constituencies, and it may not take as much work to break through if it can solve the puzzle of BJD. Congress won 19% of the vote, not 29% – so the gap of 12% is quite significant. 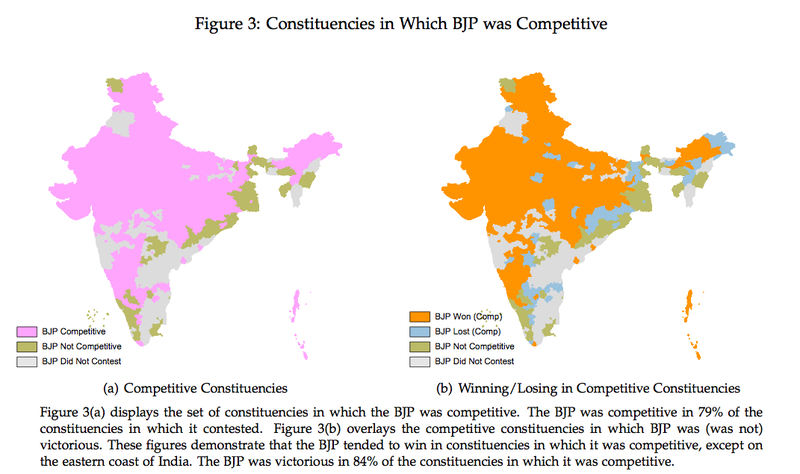 The race between the BJP and Congress wasn’t even close. Also BJP allies in the NDA won 8% of the vote vs. Congress allies in UPA which won only 2%. The NDA allies working together rather than against each other were very important for winning Bihar & Maharashtra.